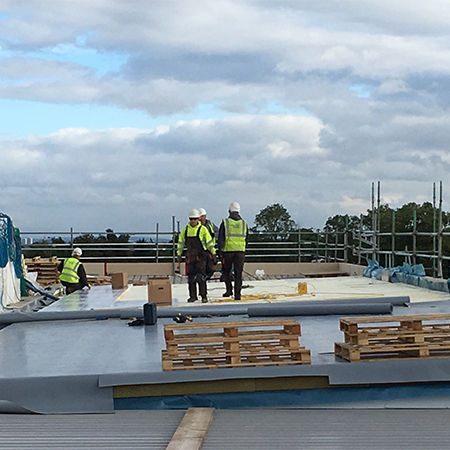 IKO Polymeric has delivered a single ply roofing system for the world’s first Joint Faith Campus for Christian and Jewish pupils. IKO Polymeric’s premium Armourplan P single ply roofing membrane in mid grey was specified to fulfill the 20 year guarantee requirement. Thanks to its superior reinforcement and high polymer content throughout, Armourplan P offers extended guarantees whilst also making the installation easier with its highly flexible characteristics. From day one, BDP Architects received a high level of technical input and expertise from IKO Polymeric to meet the challenging thermal and acoustic performance requirements. 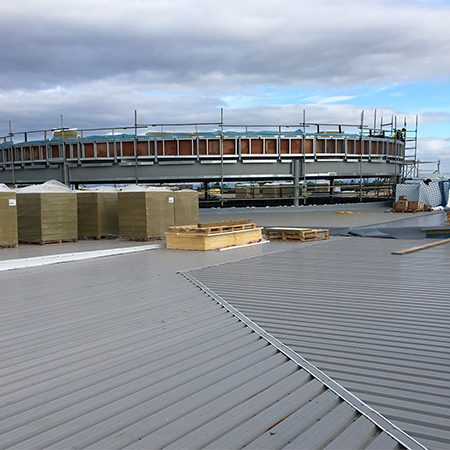 Taking responsibility for the full system build-up, IKO Polymeric delivered a robust single ply roofing solution from acoustics right through to the waterproofing layer. By using steel work and building residual corners, a 1:60 fall was achieved in line with flat roofing best practice. A tapered insulation scheme, incorporating the appropriate levels of mineral wool and PIR, was utilised to achieve the required thermal and acoustic performance. The 3,500 m2 single ply roof was completed in January 2017 and the campus will be ready to welcome its first pupils in August 2017 to offer innovative and high education services in Scotland.